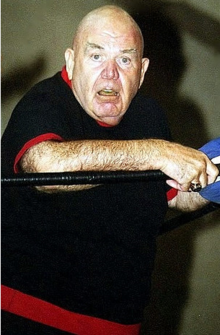 ↑ 1.0 1.1 1.2 1.3 "George Steele's profile". Online World of Wrestling. Archived from the original on May 24, 2011. สืบค้นเมื่อ 2011-04-24. ↑ 2.0 2.1 2.2 2.3 Solomon, Brian (2006). WWE Legends. Pocket Books. pp. 231–235. ISBN 978-0-7434-9033-7. ↑ 3.0 3.1 "Professional Wrestling Hall of Fame – George The Animal Steele". Professional Wrestling Hall of Fame and Museum. สืบค้นเมื่อ 2011-09-09. ↑ Maslin, Janet (September 23, 1994). "Ed Wood (1994) Film Festival Review; Ode to a Director Who Dared to Be Dreadful". New York Times. สืบค้นเมื่อ April 17, 2012. ↑ "Superstars of Wrestling Canadian Heavyweight Title". สืบค้นเมื่อ April 25, 2015. หน้านี้แก้ไขล่าสุดเมื่อวันที่ 7 มีนาคม 2561 เวลา 19:32 น.